Yes Step Darts again, blah blah blah, last few days and weeks, blah blah you know the story by now! Some lovely Darts on death row in the evening sun! 32762 is not saving the children! Dennis Trident 32762 has finally lost her branding for Save the Children which was/is First Group's chosen charity. 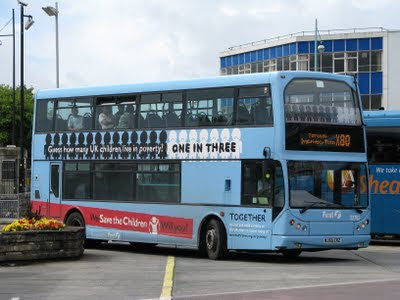 She was one of only 6 buses in the country painted into the livery to show support for the charity after First's £1million donation in 2008. The livery has looked somewhat tarnished over the last few months though, and the decision has been made to put her back into standard Barbie 3. She was out and about freshly painted on X80s today, but unfortunately, I couldn't get a decent photo from my vantage point on an X80 heading the other way! Will be a strange sight to see a Trident in Barbie over in Torpoint in the coming months. Up until now Torpoint residents 'expect' the Barbie 3 liveried double deckers to include steps! In fact its been a nice easy way of differentiating them. 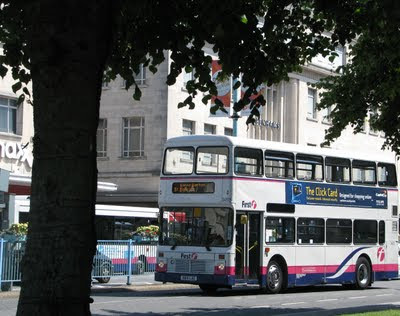 If its in Barbie livery, then Torpoint will generally complain about it being 'old'! Lets see if they notice that actually, this one is newer than the normal pink Tridents! Well this is it. Truely, yet again, the end of an important era. The Step Entrance Dennis Darts have been withdrawn from frontline service, with many due to be scrapped in just a couple of weeks. To think these have been bombing around the streets of Plymouth for nearly two decades is nearly incomprehendable. I think I'd upset quite a few people if I said they were as iconic as the Atlanteans, and indeed, they didn't last half as long! But as a younger enthusiast who struggles to remember the Atlanteans in service at all, these are my version of that type of icon for Plymouth. PCB was one of the very last companies to run the Step Dart on mass, and really, its quite amazing they have lasted this long. Plymouth accidently became quite a Mecca for Dart enthusiasts. Many other places you go, the odd Step Dart here and there is a great capture, and yet you have them running about all the time in Plymouth, or at least, did! Farewell Darts, Plymouth will never be quite the same again. Just a quick video tonight of when G615 OTV escaped into service on the 34 in December last year. Its very rare these lovely Volvos are put into service on anything other than school routes and the Plymouth Argyle specials, so to have her on a route normally run with Enviro 200s was a real treat! Such fantastic sounding machines, and they really go well. The end for the 581? 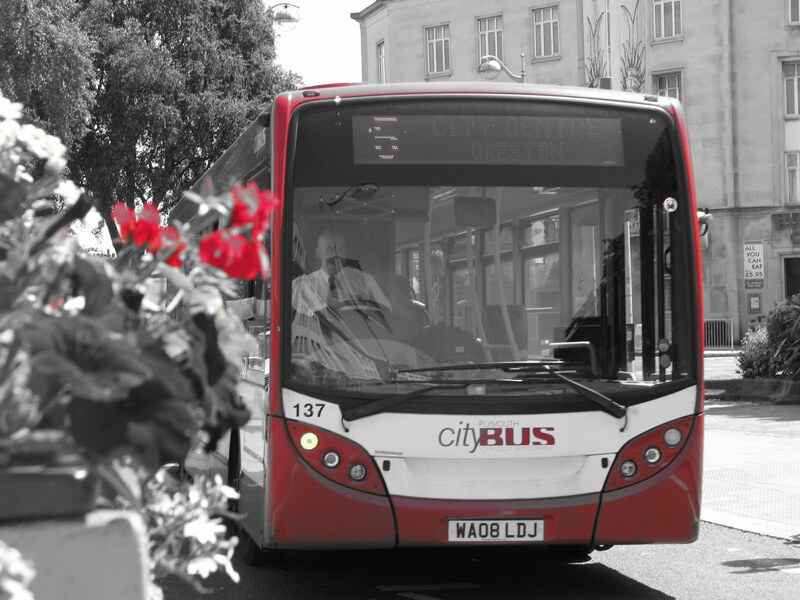 Cornwall County Council have announced huge cuts for bus subsidy in the county, that will effect many routes across the board. 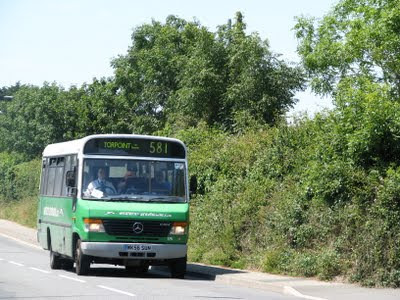 In the Plymouth area, the 581, Torpoint to Liskeard is one of 17 that could be in for the chop across Western Greyhound's network. Western Greyhound have said that they are preparing for de-registration of these routes if a compromise is not met, as with the new reimbursement rate on the concessionary passes, the routes will not be viable to run. Currently the rate is 73.5% of a normal fare, but with the cuts, this will reduce to just 44%. 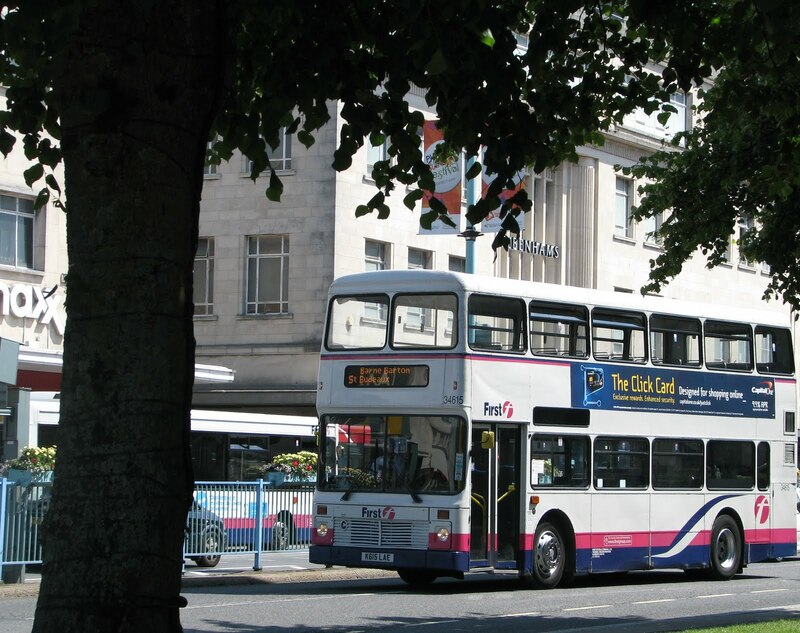 Mark Howarth has said "We are talking about routes in north Cornwall, west Cornwall, Torpoint, and even some city routes. It's right across the board, seven days a week." "If the amount of money received per concessionary passenger falls that means that we'll have to look at service levels we currently operate. 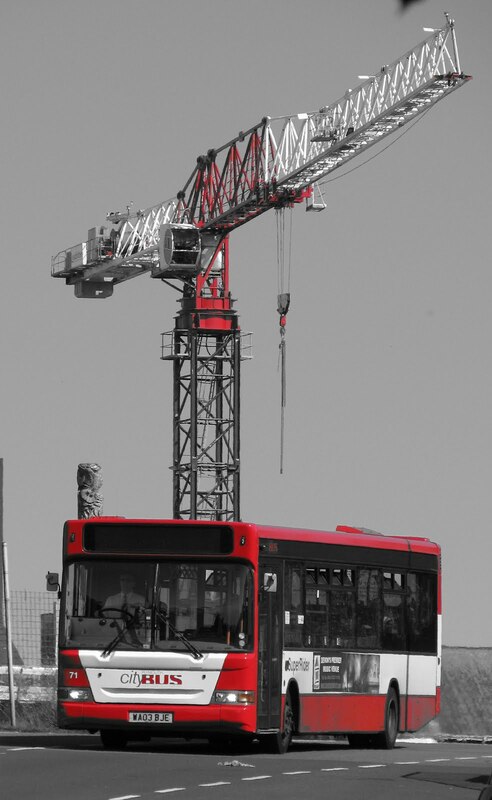 "Ultimately this decision may result in a significant number of routes being completely withdrawn. We would urge the council to reconsider, taking into account the far-reaching effects that this decision will have." It will be interesting to see if CCC will reconsider the reimbursement rate, or whether we will see some substancial cuts to the route network across Cornwall over the coming months. Sunday will see the annual Western National Preservation Group Plymouth Hoe rally, coming into its 26th year. As always I'm sure there will be a good variety of vehicles. Regular trips around the Hoe will also take place, but I'm sure some drivers will venture out a bit further. I'll be there representing A-Line Coaches, in their very first rally. A182 MNE will be our stead for the day. Hopefully, by Sunday she'll look a bit different when compared to the photos that you've seen of her on the blog, if all goes to plan on Saturday! Myself and Derrick Cuff will be hard at work preparing her, so watch this space! A182 is also due to do some trips during the day, so pop along and have a ride if you're interested! 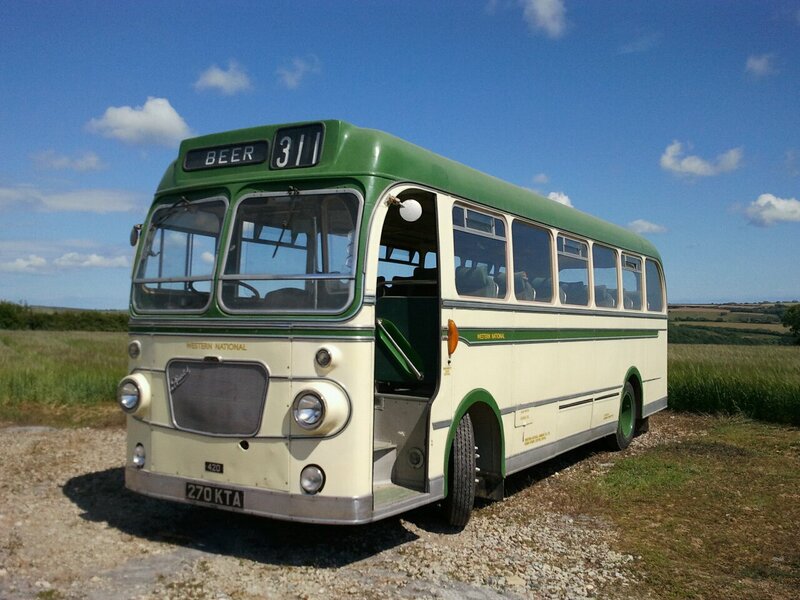 The rally as usual will kick off around 10am on Sunday, but come along a bit earlier if you want to get some good photos of the buses arriving at the rally! 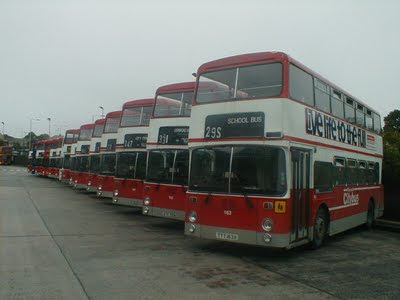 The Leylands were certainly out in force yesterday across a range of routes in the city. 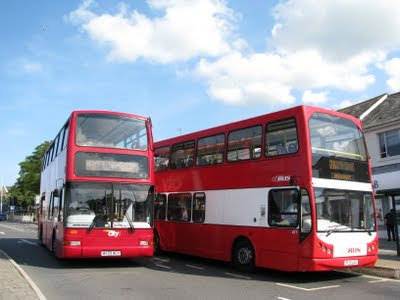 K616 and K619 LAE were both seen out on the X80, a very rare sight! All we can presume is there must have been troubles with the Tridents, or, the drivers have good taste! K614 was seen heading for Plymstock, and K615 I think was on Tavilinx services, but could only make out the Northern Counties body from a distance. 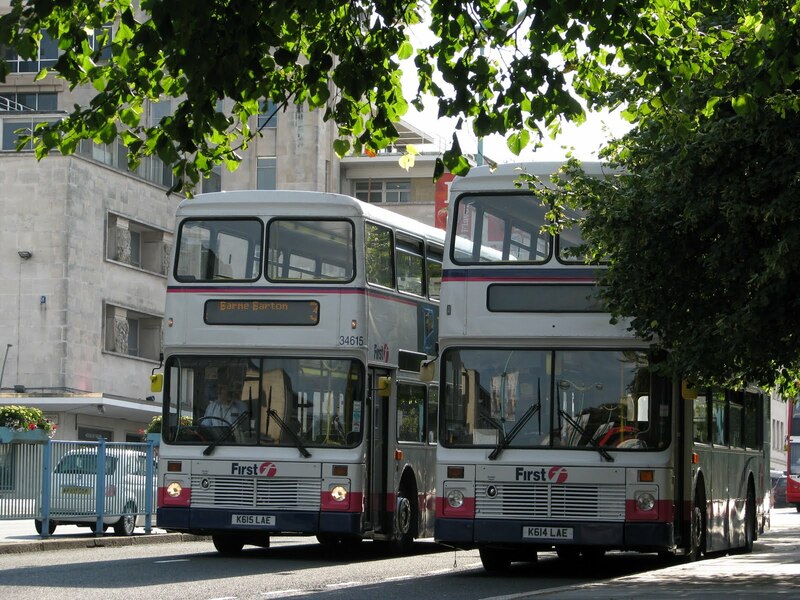 This photo was actually taken last Saturday though, and shows sisters K614 and K615 on Royal Parade, one off to Barne Barton on the 3, and the other awaiting time before her next trip to Tavistock. 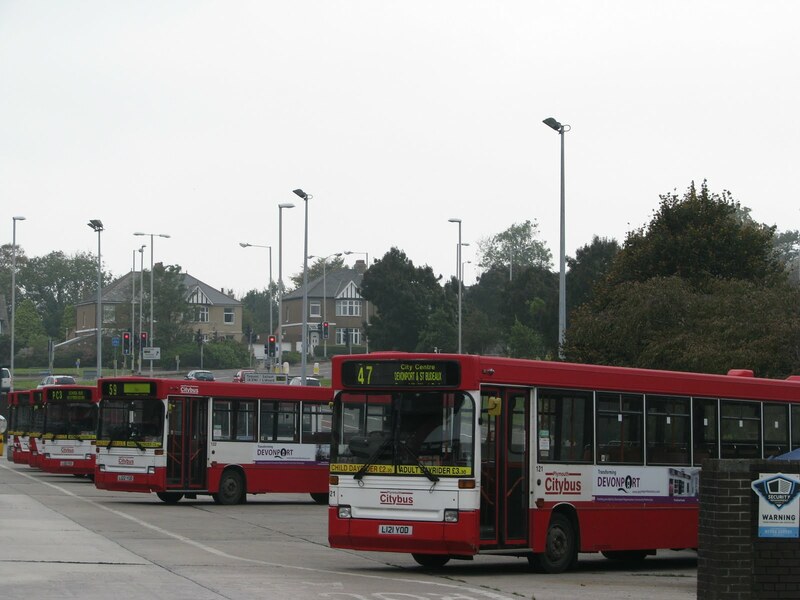 As is very apparent in Plymouth at the moment that First have been concentrating their resources on the routes into Barne Barton, and Plymstock/Elburton, in a fight to win back 'their' territory. 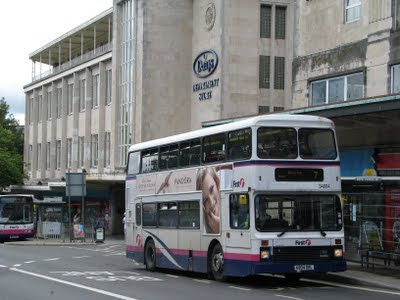 Of course this stems back to Western National days, and First are currently trying to regain control in these areas that they lost out in, during the bus war in the run up to the sale of Plymouth Citybus. 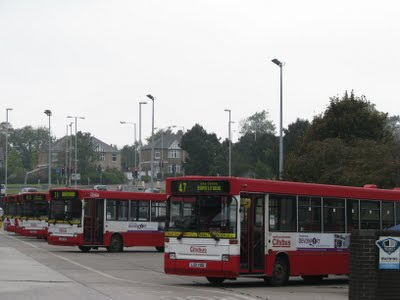 The 3, runs parallel to PCB's 26 (well really, its the other way round, the 26 was changed to copy the 3), to Barne Barton, and since it was changed to cover the same route, with the frequency increased, Plymouth Citybus have done very well with winning over customers along this popular stretch. The fact they use the Ex-London Volvos has also been a plus, in that they simply stand out that bit more. The bus itself is the company's biggest promotional tool, and PCB did well to put these out on the 26 to win people over. 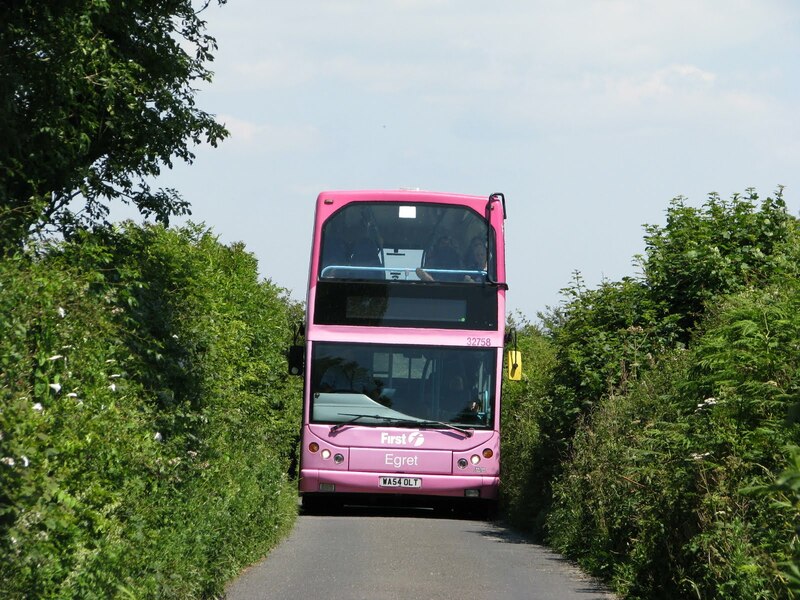 Although the B7s do still prominently work the route, in recent weeks it hasn't been that uncommon to see Darts on the route. 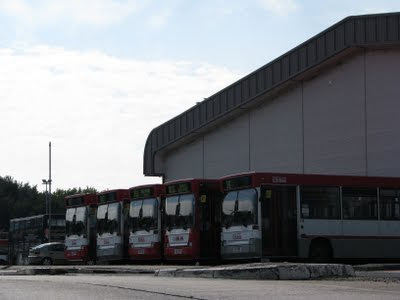 But anyway to the point, to try and win back customers FDC has upped its frequency to every 7-8 minutes, and has reduced the fares so they are cheaper than PCB. 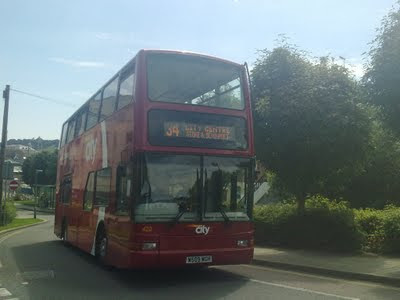 Interestingly, as I found out last week, if you catch an 81A along the same stretch from Royal Parade, to the top of Ferry Hill by Parkside school, the fare is £1.35 extra for exactly the same journey. True its a different route, but you would have hoped they'd bring it to the same price level as the 3. 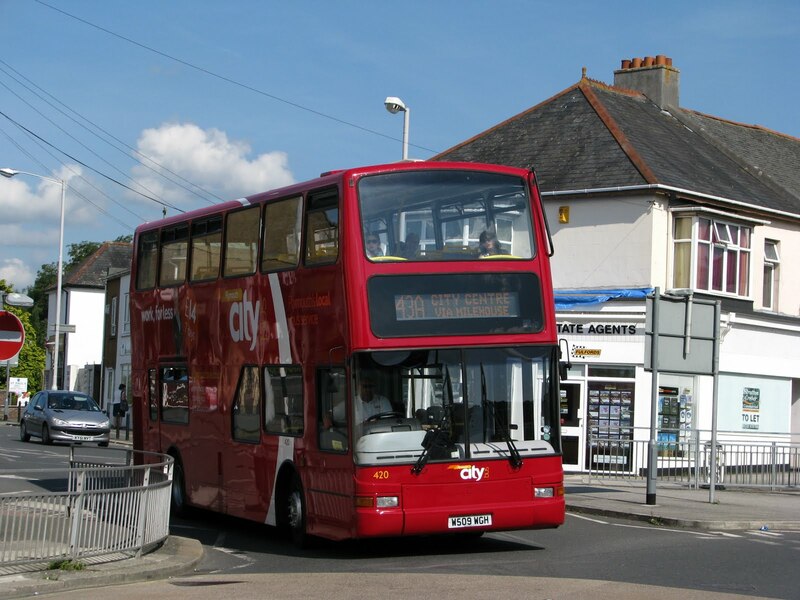 People in this area of Devonport, and along Union Street have no preference as to whether its a 3 or an 81A, and they could be paying a lot more for the same journey, just as I did! The journey is £1.10 on a 3, but £2.45 on an 81A! Ludicrous quite frankly. 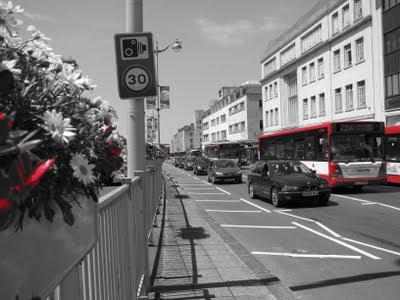 But anyway, last Saturday I was in St Budeaux waiting at the stop for a 3. 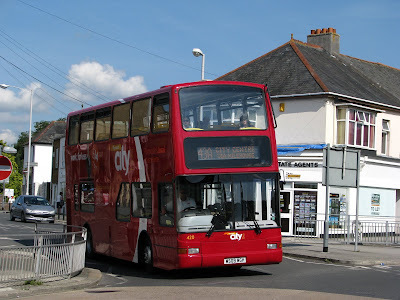 There was a Leyland Olympian on the next trip, so I thought I'd hang on for that, while another 3 sat at the stop at St Budeaux Square awaiting time. The driver thought I might be waiting for a 26, so duly notified me to the fact that First was now the cheaper alturnative on the route, which I was very impressed with indeed! Its really nice to see the drivers are trying to encourage passengers onto the service, and letting people know that they are the better option. Hopefully word will then spread, and things will start to return to 'normal' on this corridor. When I exclaimed "Oh don't worry, I'm just waiting for the Olympian behind you! ", he was quite puzzled by it, but then enquired about what I was upto, and then proceeded to have a nice little chat about the hobby itself, and the network in Plymouth! I must admit, nothing pleases me more on bus services than great customer service like this. Just having someone there to interact and be friendly with is possibly the greatest asset that a bus company could ask for. It was an interesting topic of conversation on the Omnibuses Blog last week (LINK HERE) about the public thinking generally bus drivers had a bad attitude, but it was certainly right in demonstrating the fact they simply can't make a good impression in the amount of contact time they have with customers. This is why its so nice at Torpoint, with it being a small depot you do get to know drivers by name, and vice versa over time. In larger depots this is of course not practical, or efficient, but it is still an interesting topic to discuss. 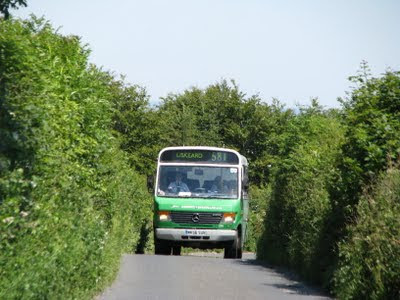 Unfortunately, the trip I did was not operated by such a fine vehicle as K804 ORL! Anyway onto the Ugos again and the other new force to be reckoned with is the new 7. 7 is now the express service to Elburton, and has actually been doing very well! It seems that an express service is exactly what they wanted, many of the passengers don't want to be fussed with going round the Broadway and Plymstock, and just wanted a direct service into town. Now that they've been given this, they do seem to have responded very well. 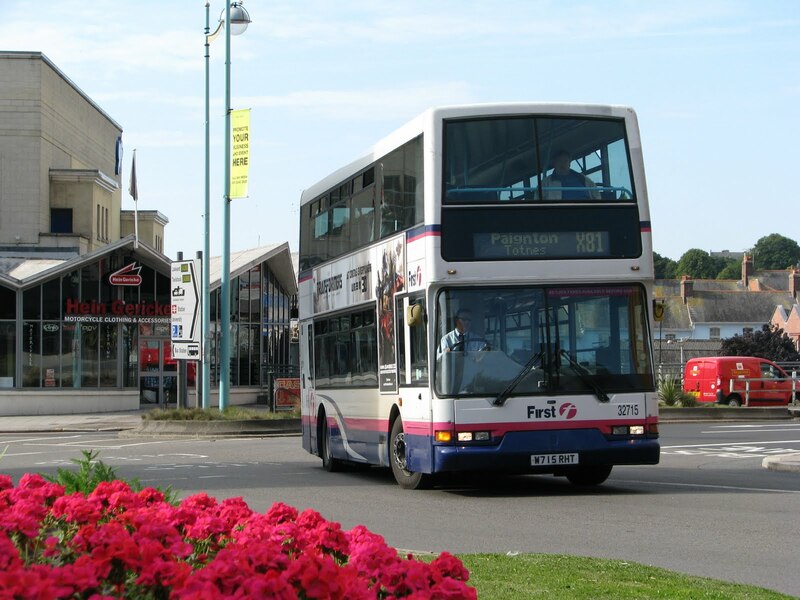 And of course if they do need to do some shopping or other activities in Plymstock, the 6 is still there to cater for these people. A perfect combination. While talking to the driver at St B, he said that 7 had indeed been carrying good loads. On the service I sampled at 11:40ish, even the outbound journey carried a good number of passengers. Some said they were mad running this service, but it so far really does seem to have worked a treat. After a while, photography in Plymouth can get somewhat tedious! 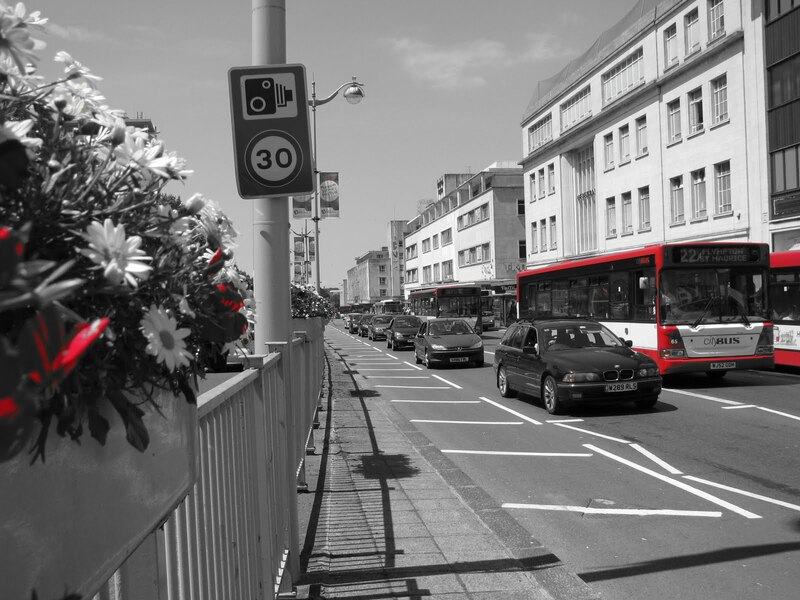 So I've been trying to spice things up a bit while taking photos, and luckily Plymouth City Council have come to my aid! Many new flowers have recently been planted, and these have been perfect to include in some photography! Red ones are also now included, meaning that I can mess around with the colour filters on the camera! I haven't quite mastered it yet as you may be able to tell, but if I can find a well enough placed plant pot, then I'm hoping this will be able to be used to get some decent colour filtered photos! I must admit though, I was extremely happy with how this one turned out! As afore mentioned, 420, the first of the newly painted Volvo B7s is now out and about earning her keep on the streets of Plymouth. Saturday saw her working the 43A which allowed the perfect opportunity to photograph her with one of her London friends. A big thanks to the driver of 420 who paused for a moment to allow me to take the photo of them side by side! Its amazing how a little gesture can go a long way, and it was really nice to see a driver helping us out, so thank you! Notice also that the 26 seemed to be lacking in passengers somewhat, but more on that later! Now anyone who says that First don't go down narrow roads anymore only has to look at this photo to be proven wrong. 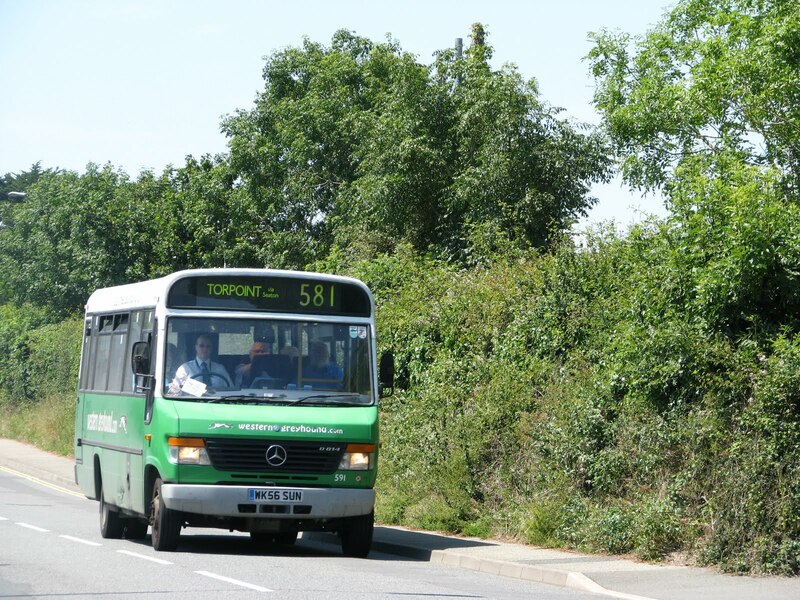 For a lot of years I've wanted to take a photo of a bus going through here, on the road coming out of Torpoint towards Antony and Saturday seemed the perfect opportunity to do so. Here we see Dennis Trident 32758 'Egret' squeezing through touching both sides of the road on its way to Cremyll in the hot afternoon sun! And for comparison purposes, here's a WGL Vario, which finds it a bit easier to negotiate the road! Today was the final day that British International would grace the hangers of Plymouth Airport, given that its closure is now only months away. 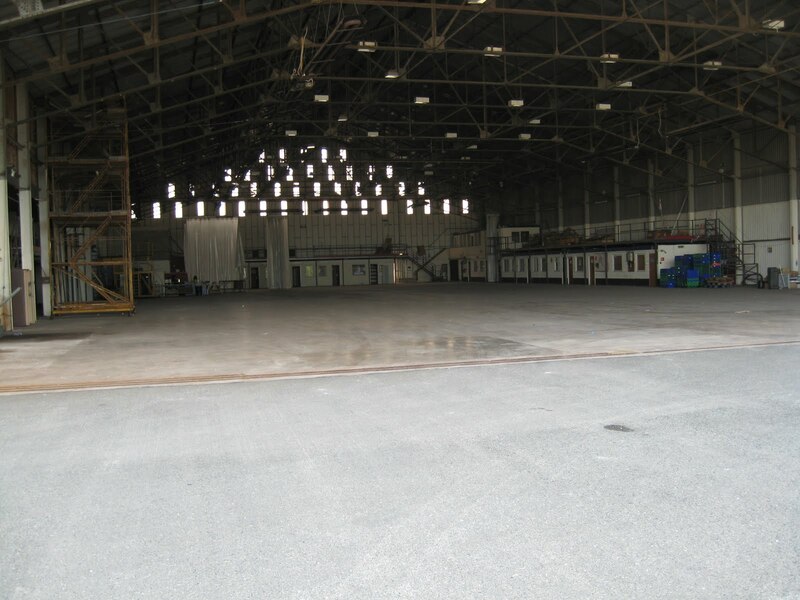 British International hold the contracts to maintain the Air Southwest fleet All the engineering facilities will now be based in Newquay, in one of the many Ex-RAF hangers that have been taken over for commercial use. 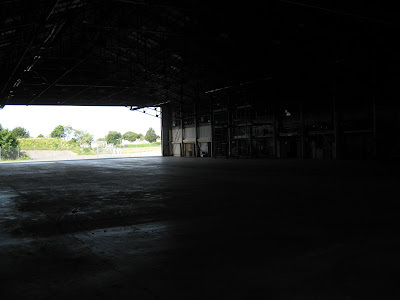 The hanger, now just an empty shell, where once helicopters, planes, and a whole host of engineering equipment once laid. The hanger will soon be demolished to make way for the ongoing development of the land. Although the campaign to keep the airport open is still ongoing, the loss of the all important infrastructure means a lot more work to turn back on if the site was to be saved. It certainly seems to show that other companies have little faith, left. It is a shame to see the passing of anything like this to do with our hobby, and although planes aren't my fortay, I shall certainly head up there to photograph the final departures from Plymouth airport. The decisions by Sutton Harbour do seem incredibly short sighted, with Plymouth ever expanding, and technological advances effectively shrinking the UK every day, meaning the far South West is more 'included' and within reachable distance, they still decide to close and develop the land. Or did we all see this coming from the start? Plymouth Citybus has now put 420, the first of the Ex-London Volvos into service over the past few days, and has been sighted on the 26 and today photographed on the 34. The decker certainly does look smart in the new livery, with the digital blind finishing it off nicely. Apologies for the photo quality, it was a bit of a rushed photo taken on the phone! Hopefully she'll be out and about tomorrow, so that I can have a chance to sample this batch of B7s.